Attacker Harry Cornick just needs to add that finishing touch to take his game to the next level according to Town boss Nathan Jones. 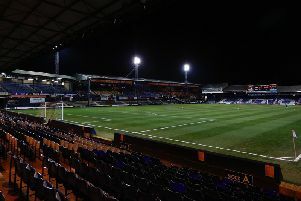 The summer signing from Bournemouth has constantly caught the eye since arriving at Kenilworth Road, with a number of impressive displays causing real panic to opposition teams. However, he has just netted one goal in his 17 appearances to date, that coming in the 4-1 win against Exeter, and wasted a number of chances during the 2-2 draw at Cheltenham last weekend, missing a one-on-one and also firing waywardly over the top too. Jones said: “We’ve had a meeting with H this week as I’m delighted with him, I really am, I’m absolutely delighted with him. “He’s been everything I thought, as he gets himself in a lot of times, but a lot of times, he then misses chances. “Saturday’s was one of those when a great set from Danny (Hylton) and a great weighted pass from Olly Lee put him in, but a lot of them he creates himself with endeavour and ability and pace. “So it’s just about adding to it, but that’s why he’s here, as if he did everything, then I doubt Bournemouth would have sold him on.